Three starting points: understanding the historic value of Lleialtat Santsenca (1928),an old working class cooperative in the Sants neighborhood; knowing to the detail the building’s (physical) state to maintain as much as possible; and being sensitive to the whole collaborative process launched in 2009 by neighborhood organizations to recover the building. third, to establish an intensive dialogue – and tense, if due – with context; and fourth, to develop a sustainable proposal, regarding the work on the existing as well as the new interventions. The building consist of three structural bodies: the main one, onto Olzinelles and Altafulla streets, houses the two main halls(old shop on the ground oor and atrium on the rst oor); thecentral one, with access from Altafulla street; and the interior one, without access from the street, which is L-shaped. 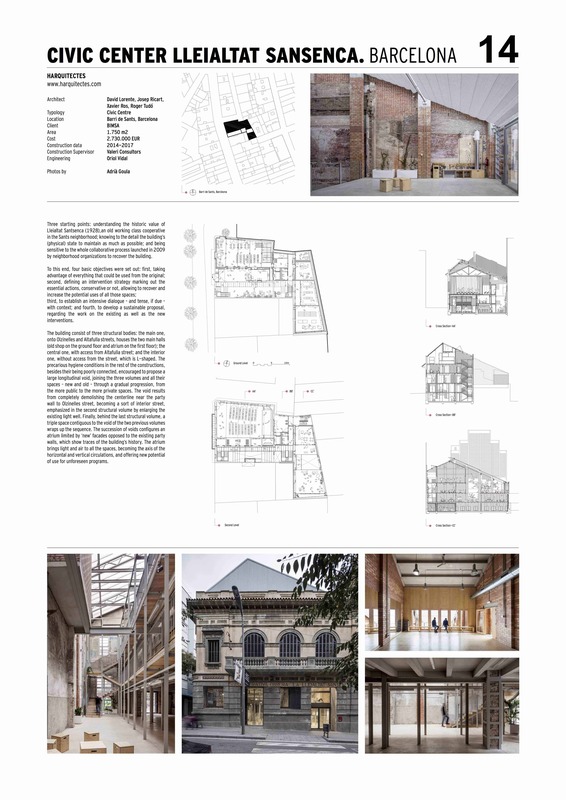 The precarious hygiene conditions in the rest of the constructions, besides their being poorly connected, encouraged to propose a large longitudinal void, joining the three volumes and all their spaces – new and old – through a gradual progression, from the more public to the more private spaces. The void results from completely demolishing the centerline near the party wall to Olzinelles street, becoming a sort of interior street, emphasized in the second structural volume by enlarging the existing light well. Finally, behind the last structural volume, a triple space contiguous to the void of the two previous volumes wraps up the sequence. The succession of voids configures an atrium limited by ‘new’ facades opposed to the existing party walls, which show traces of the building’s history. The atrium brings light and air to all the spaces, becoming the axis of the horizontal and vertical circulations, and offering new potential of use for unforeseen programs.